Shaking Nukes | News and Features | Style Weekly - Richmond, VA local news, arts, and events. A Dominion worker watches guages at a control room at North Anna. 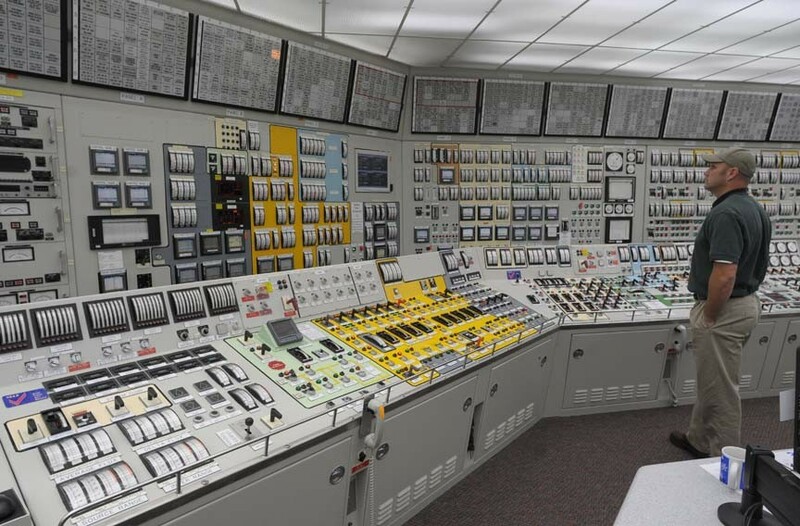 On a sleepy, summer afternoon, Dominion Virginia Power operators watched dozens of brightly lighted boxes strung across several walls in the control rooms for two nuclear reactors in Louisa County, about 50 miles northwest of Richmond. Suddenly, at 1:51 p.m., delicate sensors noticed that uranium-filled fuel rods inside the reactors at the North Anna Power station had moved slightly out of alignment. Within 100 milliseconds, control rods slipped into place between the fuel rods, shutting down fission. The operators were about 1.8 seconds behind, confirming the reactors' "scram" while boxes flashed, lights in the room dimmed and an emergency warning chirped wildly. A year ago this week, the country experienced the first emergency shutdown of a nuclear reactor because of an earthquake. In this case it was a rare 5.8-magnitude seismic event with an epicenter a few miles away. The quake ruined Louisa County school buildings, cracked the Washington Monument and shook the North Anna nuclear reactors beyond what they were designed to withstand. The company's response "was handled very professionally," says Dan Stoppard, senior vice president for nuclear operations at Dominion. North Anna was shut down for three months although it was not seriously damaged. But the overall impact for the U.S. nuclear energy industry was enormous. Federal regulators immediately ordered Dominion and operators of more than 25 other nuclear power stations across the country to review their ability to withstand earthquakes. The order took on urgency because just five months earlier, a tidal wave caused by a massive earthquake swamped the Fukushima Daiichi nuclear plant in Japan, causing the worst nuclear power accident since Chernobyl in 1986. Both earthquakes last year shook off a renewed veneer of acceptability that global nuclear power had acquired. Until Fukushima, nuclear power was getting a favorable look because it isn't as dirty a source of power as large, coal-burning plants accused of contributing to climate change. The National Resources Defense Council reports that 20 states cause 92 percent of the nation's air pollution. The biggest offenders are coal-heavy states such as Kentucky and Ohio. Virginia is No. 12 on the list. Utility companies across the country are seeking licenses for 30 new nuclear power stations, say officials from Dominion, which has applied for a license for a third reactor at North Anna. The Southern Co. has been awarded a license to build two nuclear units at its Vogtle plant in eastern Georgia, and Scana Corp. has approval to build two reactors at its Virgil C. Summer plant in South Carolina. But most of the 104 nuclear power plants in the United States are 30 to 40 years old, and replacement is sluggish at best. The North Anna event a year ago prompted a nationwide upgrade of earthquake precautions. The Aug. 23 incident exposed some potential shortfalls at the Virginia plant. During the quake, not only did the reactors shut down but area electricity was knocked out. The power plant needs electricity to keep critical controls and machinery running to prevent a nuclear accident, and has four large diesel generators plus a backup. But just after the reactor shutdown, a coolant leak knocked one of the diesels out of service. Dominion officials say the plant needs only two to operate and had enough on hand, but the malfunction was of concern. Incidents such as this plus Dominion's response and upgrades have made utility officials popular speakers on the global nuclear conference circuit. This week, for example, Dominion engineers will be lecturing at an industry event in Taiwan. To train its employees, the utility has a computerized recreation of the earthquake at its control room simulator near the reactors. But the cloud over nuclear power remains. Dominion officials still won't say if they'll go forward with a third unit at North Anna. They applied for a license in 2003 and are doing some site preparation, but won't decide until 2015 whether to build. The utility has selected a reactor design from Mitsubishi. One unanswered question is how easily Dominion and other nuclear contenders will pay for the new nuclear plants whose price tags have been soaring. The Scana project will cost $10.2 billion and the Southern Co. expansion will run $14 billion. The four reactors for these utilities will get some kind of federal loan guarantees. If and when it builds a third reactor at North Anna, Dominion officials say federal loan guarantees would be difficult to obtain in these times of budget cutting. The biggest impediment may be competing fuels. Because of hydraulic fracking methods of drilling, which use high-pressure water and chemicals to flush gas out of the ground, the energy market is awash in cheap natural gas. Coal is being pushed aside by this cleaner form of energy. Henrico County-based Old Dominion Electric Cooperative, for example, has shelved plans for a 1,500-megawatt, coal-fired plant in Surry County. Officials with the co-op blame new federal carbon dioxide emissions rules for the change in plans, but an equally important reason could be that natural gas is cheaper than coal. The changing economics, however, also could affect Dominion's plans to build a third nuclear reactor at North Anna, which could cost around $10 billion, although company officials won't estimate the price just yet.